Krill oil is the oil extracted from krill – small creatures that live in the sea. Krill oil is very rich in omega-3. And while omega-3 acids can be found in fish oil, krill oil is much better because it has several unique properties in comparison. Krill oil is most commonly extracted from the species of Euphausia Superba, commonly referred to as Antarctic krill. The omega-3 fatty acids found in krill and other marine oils, are referred to as revolutionary wonders of the medicine world. They are the subject of research by plenty of experts in the world, and have been so for the past two decades, and even further back, since their discovery. The results have shown over and over again that omega-3 fatty acids have the best properties when compared to other acids. The results of numerous research projects have presented the world with the importance of two long-chain omega-3 fatty acids: EPA (eicosapentaenoic acid) and DHA (docosahexaenoic acid). These two types of omega-3 acids have the potential to greatly improve a person’s overall health and even make them live longer, because they help prevent heart diseases, lower the cholesterol in the blood, and even prevent heart attacks. The human body cannot produce omega-3 fatty acids on its own. This means that if you want to keep healthy, you will need to plan an intake of omega-3 with your daily meals. You can do this naturally by eating fish, but that doesn’t guarantee that you will absorb the amount of omega-3 fatty acids, EPA and DHA in particular, this way. This is why a lot doctors recommend that patients who suffer from high blood pressure and cholesterol take supplements with a specific concentration of EPA and DHA omega-3 acids. This is what makes krill oil so important. As a supplement, it can ensure that you absorb just the right amount of EPA and DHA acids your body needs. Research has also brought forth plenty of other benefits of krill oil. 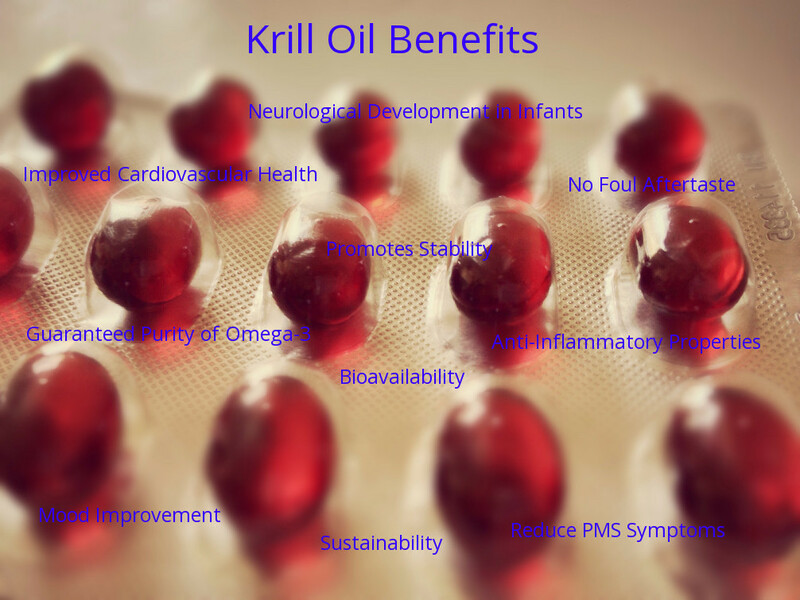 Go through few of the top krill oil benefits recently published by Krill Oil Ultima. Today, more and more research into omega-3 fatty acids concentrates around krill oil, and below you will find the greatest benefits of adding krill oil, or krill oil supplement to your diet. The omega-3 fatty acids found exclusively in krill oil will improve your cardiovascular health within a week of use. What happens in your body? The omega-3 fatty acids will help reduce the bad LDL cholesterol level, while increasing the good HDL cholesterol. Additionally, the omega-3 fatty acids have anticoagulant qualities. This is why scientists have stated that krill oil consumption can actively prevent heart attacks and other blood clots. Fish oils can leave a nasty scent and taste in your mouth. Additionally, fish oil supplement gel capsules tend to be bigger than krill oil gel capsules. This makes krill oil supplements easier to take – you don’t have to swallow such large capsules to get what your body needs, and will not leave a foul aftertaste on your tongue. The omega-3 that is harvested from krill and found in krill oil is considered by numerous doctors to be the purest form of the acids. This happens because fish oil is harvested differently, and may contain toxins and poisons which you do not want in your body. Krill are tiny creatures that feed only on phytoplankton which does not contain mercury or other toxins. Krill oil is very effective when it comes to reducing and preventing inflammation in the body – which is why it’s highly used to threat pains caused by arthritis and other similar afflictions. According to researchers, the omega-3 fatty acids are converted into hormones called eicosanoids, which are very powerful and are known to promote the release of anti-inflammatory prostaglandins. Adding krill oil to your diet will ensure that you will see an improvement in your overall mood and happiness. Studies have shown that the EPA and DHA omega-3 fatty acids have great anti-depression effects. Omega-3 is known to promote the production of hormones called corticotropin, as well as boosting the levels of dopamine and serotonin. Overall, omega-3 fatty acids can help you battle depression and make you happier in general. The omega-3 fatty acids found in krill oil have been proven to reduce unpleasant symptoms of PMS, especially physical ones. While researchers haven’t been able to conclude why omega-3 has such an effect on the female body, the common theory is that omega-3’s hormone regulation properties enable the body to reduce the symptoms of PMS. There is an antioxidant that can be found in Krill oil called astaxanthin. This helps krill oil stay stable, and prevent it from going bad both in and out of your body. And let’s not forget the benefits of antioxidants for the human body, which are thoroughly researched and documented. Due to the fact that the composition of krill oil is different than the composition of fish oil, for the same amount of oil, less krill is needed when compared to other fish for fish oil. Additionally, the omega-3 fatty acids found in krill oil attach themselves to phospholipids instead of triglycerides, making the omega-3 from krill oil easier to absorb. In simple terms, you need to ingest a lower amount of krill oil to absorb the same amount of omega-3 acids than fish oil. The krill weigh approximately 500 million tons. They are the world’s biggest single biomass. The best thing is that within one year, only 1% of the biomass is used to create krill oil, making it a very sustainable source of omega-3. Omega-3 is crucial to the development of the brain, the eyes as well as the central nervous system in unborn infants. This is why plenty of gynecologists advise future mothers to increase their omega-3 intake to help the neurological development of their unborn babies. Rashmi, a dedicated and qualified nutritionist with over six years of experience in the Indian food industry. She has done MSc Degree in Human Nutrition at Chinmaya degree College(BHEL) in Haridwar, Uttarakhand.